Item # 314250 Stash Points: 5,495 (?) This is the number of points you get in The Zumiez Stash for purchasing this item. Stash points are redeemable for exclusive rewards only available to Zumiez Stash members. To redeem your points check out the rewards catalog on thestash.zumiez.com. Become a technical riding master with the Thank You Daewon Tiger 8.0" Skateboard Deck. Very mellow concave makes for a classic feel and stable landing surface, while wide, long and moderate pitched kick tails ensure beefy pop with quick responsiveness. Small wheel wells leave space for looser trucks while a trippy tattoo-inspired tiger graphic makes this deck worthy of wall mounting, if you prefer. 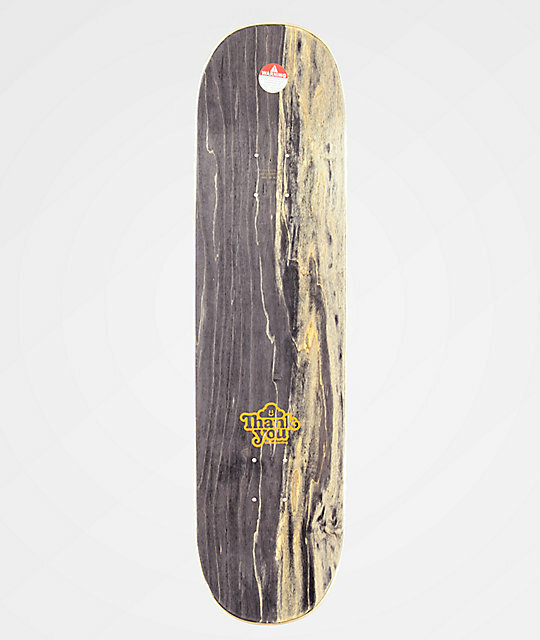 Daewon Tiger 8.0" Skateboard Deck from Thank You Skateboards. Official Daewon Song pro model. Wide, long kick tails with moderate pitch and a steeper nose than tail.